The giveaway is now closed. Thank you to everyone! I will try to make this as un-wordy as possible, and just let the pictures speak for themselves. While my quilt is a mash-up of the Kona color card and Pantone, the original spark of interest for the quilt came from here.Lynne's fabulous Penquin Book quilt. I became an immediate fan of the quilt, and also of Lynne. When I came home from spring quilt market with my charm pack of the new Kona colors, along with a new Kona color card, the wheels in my head started moving. 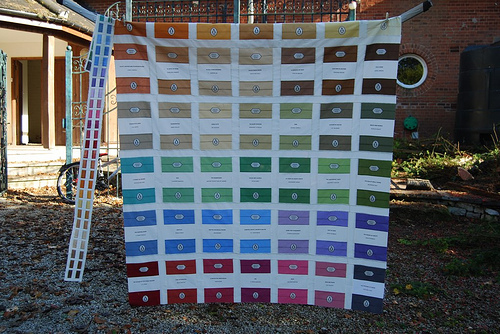 I had the idea for the quilt, but how would I obtain a little bit of every single color? I only needed a little, but buying even a fat quarter would be way too expensive. That's when I went to Fat Quarter Shop and ordered every sampler charm pack of Kona. I was sure I would end up with many duplicates. I was thrilled to find out that there were hardly any duplicates at all! I took them apart, and started separating them by color families. Then I started arranging them in order, using the color card. I used some Pantone note cards for the dimensions for each block. The next step was to print out all the colors names and numbers. I had to buy two 25-sheet packs of June Tailor printer fabric. Wowsers--expensive! Thankfully I had good coupons for each pack. Just let me say that if I hadn't had to run so many sheets through my printer, I would definitely have used Kona white and adhered it to freezer paper, carefully cutting it with my rotary cutter, but I was worried about running so many sheets through the printer and jamming it up. I do not like the printer fabric. It served its purpose in this quilt, but it feels and sounds crunchy, which I really dislike. However, it went through my printer like a dream so it got good brownie points for that. The next step was to proofread each color and make sure I hadn't transposed letters or numbers. Next came matching the the names with the correct colors. You can see the difference here, but it took the really good natural daylight before I realized I had them switched around. And would you believe it, when it came down to it, there were only two colors I was missing: Ruby and Regatta. I was sure I had Ruby because I had used it in a previous quilt. I was pretty sure I didn't have Regatta. I'm not really a "blue" person, but I checked my solids stash, and sure enough, there was Regatta, also used in a previous quilt. Hooray. I think at that point I was sure it was a cosmic decision to make this quilt! The next step was to put each block up on the design wall, duplicating the same order as the color card. There were 243 blocks, but my layout plan of 16 blocks across and 16 blocks down gave me space for 256. That's when I started copying and printing things from the the color card and bordering them in black, including the washing instructions! And that turned out to be a really good plan because with all the color going on, it was a good thing to have a few different places to rest your eyes. After I made sure, over and over, that all the colors were in the proper order, it was time to start sewing the rows together. And then, as frequently happens with my quilt tops, things came to a complete standstill while I tried to figure out the whole quilting thing. I knew I didn't want a lot of quilting to show because I wanted all the focus on the fabulous colors. I got advice from a couple of people, and then Deborah taught me how to spray baste a quilt on top of a bed (!). Note: I may actually get more of my quilts completed! 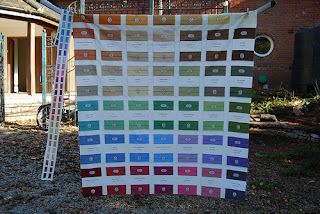 At first I thought just quilting horizontally would do the trick, first just below the words in each block, and then in the ditch between the white band and the color block. But then I realized I wasn't going to be happy until I quilted vertically between each row. The dilemma? While I'm not a fan of quilting in the ditch, I still didn't want the quilting to show. And besides that, there was such a range of color from dark to light that choosing a color of thread, well...I couldn't even go there. So I tried something I had never tried before--monofilament. It turned out to be a great solution. It didn't show on top, but gave a little definition between each row. I wanted a simple back, but with some pop, so I used the wonky alphabet from Kelby Sews, and pieced a heart with some leftover scraps. I finished it with Red Pepper Quilt-inspired black and white striped binding. Really--would anything else have worked? I think not. And with a nod to Pantone and the color of the year, Tangerine Tango, here is my label. So that's the story of my color card quilt. It was a challenge I gave to myself and I'm thrilled with how it turned out. My sweet and very supportive husband, Mark, turned out to be very protective of this quilt, or at least the idea of it, and forbid me from posting a single process picture until it was completed. And in my dreams, Robert Kaufman gives me a lifetime supply of Kona solids. Or wants to add this to their corporate quilt collection. But I'm happy to hang it in my hallway and gaze happily at all the beautiful colors. I hope you enjoyed reading about my little creative journey, or at least looking at the pictures. Want "one in every Kona color" for yourself? Well, scraps, that is...these are only about 1 by 5 inches, but I'm pretty sure all 243 colors are represented. Just leave a comment telling me your current favorite color. I'll choose a winner on Monday morning. Have a great weekend! Well! That WAS a post worth waiting for! A fabulous quilt...the idea and the execution...thankyou for sharing. Now whilst you arent a blue gal, I am and love Kona Periwinkle. Those offcuts would be a treat. I love this quilt. Having just got myself a colour card, I'm loving looking at it so I can imagine how much you love your quilt. Kona could at least give you 50% off for life! I love this quilt so much! I just had an idea and wondered if you ever thought about having Spoonflower print up the text part of it? My favorite color is Kona Charcoal! Maybe my favorite quilt of all I've seen this year!!! I love the story. I was drooling all through, loving that top and then BAM what a back, too!!! This is a great great quilt! Good job. My favorites are mango and papaya, but I need to try some of the new ones, too. Thanks for documenting your process. It's a lovely quilt and I'd love to play with your scraps. My favourite colours are in the greens -- how about asparagus-- and Kona charcoal, and even Kona espresso, but really, why should I choose? I love all of them! That is quite the accomplishment. Amazing. I love string quilts in all ways and shapes. These strips would really be fun to create a table runner. My favorite color is robin egg blue. Hmmmmm so cute. What a marvellous quilt - I love the story behind it and it was lovely to have such an insight into the planning and execution! Favourite Kona colour? Let me just consult my new colour card...lagoon!!! This is AWESOME, Cindy! Such a great idea and it turned out beautifully. Way to go! Thanks for linking up with TGIFF! I am crazy about Kona solids also and your quilt is gorgeous. I think my favorite color is Pacific. I would do just about anything to have your scraps! Oh my, that is just fantastic! You are one talented lady. I could make one from your directions (I think), but I could never come up with the idea.....sigh. Would love to win. I think my favorite Kona color right now is Chartreuse. That quilt is fantastic! Right now my favorite colour is orange, any bright orange, which is strange, because it was the one colour I've always disliked! What an amazing journey!!! I can't imagine not getting any mixed up along the way. Plus...I can't believe you kept it a secret so long. It is beautiful and a true work of art. I think you deserve all the Kona solids for a lifetime!!! Green is my all time favorite color. Wow, that is absolutely amazing work and the result is so stunning! My favorite color right now is red, like a true, honest cherry red. I've been adding pops of it to my living room and I love how it looks against the background colors. Wow! I think Robert Kaufman is crazy if they aren't knocking on your door to at least rent this from you for Quilt Market (I'm not sure you should let it go forever...too much work went into it!). I love so many of their colors, but today I'll choose pomegranate, and I would love to play with those scraps - how fun! Cindy, congratulations on this gorgeous quilt!!!! So happy to see the completed project and hear about your process. This definitely deserves a lifetime supply of KONA solids. How generous of you to share all your scraps. My favorite color at the moment is Lagoon (and my latest itunes Playlist....ha). Happy Friday! My favourite colour at the moment is Mulberry! I love your quilt! I am amazed that Ruby and Regatta were not in the sample packs, but good to know in the future! I hope to someday make my own version of this quilt! My favorite color at the moment is Cerise. Are you kidding me??? ?Cindy, this is incredible. I'm happy that Mark encouraged you to keep this to yourself and enjoy the process without having to answer to anyone, or consider well-meaning suggestions at every turn. This is so much fun. Congratulations on matching up the colours and their names. I have such a hard time doing that with the colour card! Bravo!!!!! Your quilt is inspiring. My favourite colour is Caribbean. I just have to say that I think it is so neat that your husband wanted you to keep it a secret! It is really awesome and I bet that Robert Kaufman WILL want it! I've wondered about that printable fabric. I like Anne's idea of using Spoonflower. It goes without saying, but I'll say it anyway... your quilt is amazing. My current favorite Kona color is Raisin -- it is fall after all. This is absolutely amazing!! I enjoyed reading the entire process start to finish without having any sneak peaks along the way. Enjoy your beautiful quilt and I'll think happy thoughts about you getting a lifetime supply of Kona. This quilt is amazing and I really enjoyed reading about your process! Spray basting on a bed sounds like a great idea, I am going to have to try that! My favorite Kona color is papaya! WOW WOW WOW when i saw this on instgram this morning, I just had to get to a fell screen to see it in its glory..... (not quite full glory as that would be in person). I love you problem solving by adding the addition info from the card. It not only gives the eye a place to rest but it adds texture and interest. All the adjectives have been used so I'll go with GOOD JOB, WELL DONE!!! I Think this shd be hanging in the lobby of the Robert Kauffman offices. A favorite Kona color would be impossible for me to choose as they change constantly depending on the project. I love all the greens and purples. I use a lot of coal. My current favorite color of the week is slate. It is the perfect match and contrast in my swoon blocks. Wow, just wow! I think this is one of the most stunning, fantastic quilts I've ever laid my eyes on! What a fantastic idea for a quilt! My favourite Kona color is aqua, I guess I'll never tire of using it! I love yellow, any yellow. But mostly I am so thrilled with what you accomplished. And I agree, they should be giving you something. I've come across some generous companies and some maybe not so. Make sure Kona sees this too! Wow, what a great idea and what a gorgeous quilt! Your quilt is a masterpiece! I love working with Kona solids and am always surprised how many different color pairings look fabulous together. My favorite color is sage. What a spectacular quilt! My favorite Kona color is Caribbean. Fantastic quilt! My favorite color is cornflower. Thanks for the great giveaway! Just incredible, Cindy. I'm so impressed! I love this project, and I bet the Kaufman folks do too! All of your hard work certainly paid off!! Thanks so much for inspiring us all to set our eyes on the finish line and not get distracted along the way. what a great read! I am in love with color, so this is right up my alley. I did something similar with Fairy Frost (yet it sits without binding on it). Fave Kona color: black. I buy it by the bolt. I love the brights, and the black makes them pop. Great quit. Such a great post - love the whole idea and execution of this fantastic project! And scraps - yes, please!!! Thanks for the chance to win! Forgot my favorite color - Charcoal, but I also love Lagoon and Cerise. That is an amazing quilt. I am personally crushing on Kona Charcoal right now. I really admire your ingenuity in making this quilt. It looks great and is so original! Awesome job!!! My favorite color is KONA 1514 Robin Egg. Cindy, it's fabulous! What a great idea! And so secretive you've been. I hope Robert Kauffman does indeed give you a lifetime supply of KONA solids. You deserve it! And I can't believe you're giving away your leftovers -- I'd love to have them! What an amazing undertaking! I absolutely love it and feel sure the Grand Poobha at Kona will contact you about, at least, using it on loan outside the Exec. Office :) Current fav color: 1295 pomegranate, but they ALL scream at me when I start auditioning them! I saw your quilt on the Hancocks Facebook page & googled for your blog just to see some more of it! I'm so glad I found you. I love everything about this quilt - such a great idea. I love this quilt. I am working on a hand dyed color sample wall hanging and when I saw your quilt I was awestruck. What an incredible amount of work and talent you have poured into this. It is beautiful. Congratulations! PS I happily would take any scaps you have- I love kona. All my dyed samples are from PFD Kona white! Wow; so many colors; so little time!! I saw this on Hancocks of Paducah Ky facebook page, and have enjoyed checking out your blog! Thanks for sharing such a great idea! So creative! Still in love with this quilt since you first posted it! I think it is brilliant with the text! As for the June Tailor stuff, I hate that hard feeling, but I have tried the freezer paper method to no avail and I used a nicer fabric from June Tailor that was very soft and wonderful...but learned the hard way that it was very washable...meaning it all washed away :(!!! Oh..and I will just try my hand at winning...Pomegranate. I have never bought it or had occasion to use it. But I love it! What is wrong with me! I like the Kona Bone, but there are so many great colors, it's hard to pick one! I love your quilt, what a brilliant, BRILLIANT idea!! I am loving the Kona Pomegranate. Your quilt is amazing!!! What a fabulous quilt! I love the School bus yellow fabric. My sister and I painted our last kitchen that colour. Yes it's bright but there were lots of windows and it was cheery! The quilt is brilliant! I'm a quilter and have been in the graphic art industry for 40 years ... so I love the Pantone book idea. My favorite color is Crocus. That is truly amazing, unique and beautiful! So many favorites but right now I'm obsessed with true reds, so perhaps Pomegranate. Nicely done... the quilt is beautiful and the fun back is a nice extra touch. But I'm overwhelmed at all of this. I knew about the beginning and heard about bits and pieces until now, but I'm am simply amazed by this quilt. I love the story, too, especially how you drew on all your quilty friends to help you figure it out. I like that a community of quilters and a community of colors went into the making of this quilt. What a great quilt! My favorite color is Surf. Wow, Cindy! It turned out so great. What a concept and how well executed. This is another I would love to copy you on, but honestly, I don't think I have the fortitude! I think Robert Kaufmann better give you a lifetime supply of Kona. This is so awesome. My favorite color. I don't know. To be honest, I can't choose. I love them all, especially when they are all laying together like this. Cindy, I am so impressed. You blow me away. I love your colour card quilt. It would be cool to win your little strip of scraps. You always amaze and inspire me! Try using Printed Treasures next time you have to print on fabric. It has a high thread count, is soft and retains the color. I love and use it for pictures and labels. My favorite Kona cotton is Lime. I saw your quilt today on facebook - first from Fat Quarter Shop and then Hancocks (have you ever been there, it is amazing). I clicked on your personal fb page and saw that you are a Tabor College grad, I graduated from Sterling College. And my husband's cousin is the head womens bball coach at Tabor. My favorites right now are artichoke and ash. LOVE your Quilt!! Great story! Cool website! Creative and inspiring! Your quilt is beautiful, both ornamental AND functional! Kona is a great fabric to work with, when it comes to solids, I don't even look at anything else! I hope they DO give you some perks! I'm going to bookmark your site...thanks for the smiles! Cindy-- this is so awesome! I hope I get to see it one day in person. My fab kona color right now is pomegranate. Seriously amazing quilt! I loved reading about your process in putting this together. Such a clever idea and you pulled it off beautifully! You are absolutely amazing my friend! Who else would take on this challenge? It is gorgeous ad the orderly way you explain your proces, it sounds doable! My favorite color - today it is Kona Aloe! i very nearly fainted when i saw this quilt! marvelous! i love kona, too, and have maybe half the colors in my stash. would love to win your scraps! my fav kona color: cactus! this is so creative and wonderful. I would clap if I saw this quilt in real life. OMG!!! That is an amazing quilt!! Good for you for completing this and persevering through!! I love the flame orange you have its so fun! This makes me want to order all those little charm packs as well!! Oh wow! I've had my brand new Kona color card sitting on my breakfast bar for the last few weeks, just enjoying the rainbow goodness. I can't imagine having that beautiful quilt to look at all the time. My favorite color right now is Glacier. Omg Cindy its so fabulous saw a tidbit from fat quarter shop on fb but didn't know it was you (I didn't read it) its so awesome they should pay you to make another one so you can keep this one. I was gonna say I would have loved to quilt this mostly just to see it it in person but your simple clear thread lines was the absolutely perfect decision. And im sure I will see it in person hanging somewhere soon. Favorite kona solid any thing pink pink pink ttyl actually really soon. Fabulous, I'm liking Charcoal-Kona rocks! Is it legitimate to say that there are too many lovely colours to have a favourite! Not having a colour card makes it hard to decide too! LOL! I love all of the shades of brown, especially Espresso! This quilt is fabulous! My favourite of the year I think :) I love kona charcoal and all the blues. I'm in awe! What a great idea and amazing execution. I have quite the rainbow of Kona solids in my stash and I'd have to say I love tangerine. What an absolutely awesome looking quilt you've turned out..love it! My favorite Kona colour (hard to have just one, you know) would have to be Glacier. Omg....to pick just one color as my favorite! I would have to go with Kumquat, that color just sings to me. I love your quilt. What a beautiful tribute to Kona! What a beautiful quilt! Such a fantastic idea! My favorite Kona color is School Bus right now. I love this quilt. I have so many favorite colors - for this comment I'll narrow it down to asparagus! Awesome job on the quilt! I love this project! Congrats on finishing it. My favorite color is that lagoon shade of blue. I always have one favorite color (although I adore ALL colors! ): and that is GREEN!! I am always and forever a green lover. :) ... I'm also a rainbow lover and this quite is HEAVEN!! You did a fabulous job Cindy!! Orange is my color. I would love to own your scraps. Thanks for sharing. I think your quilt is awesome. Like a big color card only better. Cindy, wow! And to think I have trouble finishing a simple patchwork quilt! The dedication here is fantastic. I love the baste on a bed method...why didn't I think of that. Go Deborah! I have visions of you and Robert Kaufman in a photo shoot with the quilt. :-) here's hoping for that free life time supply of fabric! Such a wonderful quilt. Utterly fantastic! So well done. And you quilted it yourself. Yahoo!!!!!! I'm in awe of your brilliant idea! Doh! I forgot to add, I LOVE the back of the quilt as well. It's simple and perfect in every way! Really neat project. Genius, and so much fun! want to tell everyone about it. Absolutely amazing! What alot of work. I love the idea. I have to say my favorite right now is Kona Snow because it is such a workhorse and goes with all the other colors that I love! Thanks for sharing! Wow. I just finished a modest little mini that includes the 28 new colors, and I was going to post it tomorrow. Well, haven't I been SHOWN UP. This quilt is so fun and absolutely amazing. I can't wait to hear what becomes of it! P.S. My favorite Kona color of the moment is flame. What a fabulous idea and the quilt is gorgeous. I have just started adding solids to my quilts and I think I'm in love. I just added Kona ash to a quilt for my daughter and think it is going to be a favorite. Thanks for sharing. I love Kona Ruby, always in love with red. But I use a lot of Kona bone in my quilts - its a great background color. This is a wonderful idea! My favorite Kona color right now is a toss up between curry and leprechaun. Maybe Robert Kaufman will send you a complete set of FQ's! this is most amazing. i love that you worked so hard to get exactly what you wanted. i think tomato is my favorite kona color. Love it. Have a bad connection and will finish comment later. Just want a chance at the scraps. I look so forward to your posts and follow your blog religiously. I love the back of the quilt with words. I am presently working on my first "words" quilt using Tonya Ricucci's book as my teacher. I too have made and donated quilt/and time to our local MCC Relief Sale/Auction (in Va). I love the way you pre-marketed the quilt on your blog and raised more publicity and money for the auction. Great idea! This is so so so beautiful! Very inspiring. Thanks for the great story! Wow, what an ambitious finish! Congrats to trying new things too, using the monofilament. I love Kona pacific. A follow-up post by the winning commenter to show how they used your Kona scraps would be a great sequel to this amazing story! Wow! What a fabulous quilt! I love all the kona colors. One favorite is sour apple and my favorite neutral is coal. Wowzers! That is one gorgeous quilt! Love everything about it! Favorite color? I'm a fan of Snow as a neutral and anything in green. The BEST. QUILT. EVER!!! Seriously love this! As for my favourite colour, at this moment in time its Kona Pacific. I absolutely love the quilt! I wish I had time to devote to such a grad venture. My favorite color ever is YELLOW! ANY YELLOW! This is the most beautiful and creative quilt I have seen in some time. I literally think I sucked in my breath when I saw it - so inspiring, thanks for sharing! I love a lot of Kona colors but I always go back to Kona Ash. It's definitely the perfect neutral. What an amazing quilt! My favorite color is purple. Thanks for the chance. This quilt is A-MAZING! And I saw that Robert Kaufman pinned it. Hopefully you'll get your wish of a lifetime supply of fabric. If only... My favorite Kona right now is chartreuse - but it's so hard to narrow it down! What a fun quilt! I love reds, but they are all fantastic! Congrats on this great finish! I like Kona coal as a basic grey, I use that a lot. That's so amazing!! I love the quilt, and the process was brilliant to read about. :D My current favorite color...I guess I've been drawn to navy a lot lately, but honestly I've never met a color I didn't like!! If you were standing in front of me, I would bow down! Lovely quilt. So inspiring. I love the story. Thank you so much for sharing your ideas and the creative process. I really like Kona Water. CINDY!!! This is absolutely AMAZING!!! I understand your husband's thoughts about keeping it to yourself until it was done, but I almost missed it. Please tell me you have sent this to Robert Kaufman! I wouldn't be surprised at all if they want to show it off at Market or something. Way to go! Wow! That is SO MUCH work! But it is beautiful.